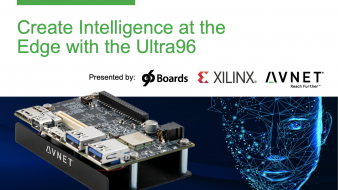 The Ultra96 development board is the ultimate SoC board featuring the power of programmable logic integrated with a multicore processing system. Designed for intelligent applications, this board is perfect for your next smart home, robotics, or autonomous vehicle project. Join this informative webinar to learn more about the board, how programmable logic can elevate your project designs, and how to get started. For 15 years, Bryan has been helping Avnet’s engineering customers adopt cutting edge technologies by creating development boards, writing tutorials, developing hands-on SpeedWay training sessions, or presenting at X-fest events. His latest project is the Ultra96. Right now, Robert works as community manager for 96Boards at Linaro. He helps monitor and maintain several of 96Boards’ Open Source orgs and repositories, runs a variety of community driven projects/initiatives, and hosts a live, weekly online video “podcast” called “96Boards OpenHours”. Craig has been with Xilinx for the better part of 20 years, 15 of them working with customers as a Field Applications Engineer, and now in Technical Marketing focusing on embedded products within the Xilinx product family. Outside of work he enjoys traveling, cooking, writing, and occasionally performing music and stand-up comedy. He lives in Denver but, depending on who’s asking, may share that he grew up in New Jersey. Alex creates electronics videos and tutorials at Hackster.io in San Francisco. She grew into hardware as a First Robotics team member, then as a director of the AHA and Noisebridge hackerspaces, and as an Artist in Residence at Autodesk's Pier 9.